ARRA News Service: Have Nikita Khrushchev Words For America Taken Root? 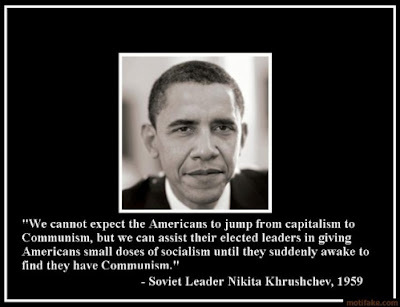 Have Nikita Khrushchev Words For America Taken Root? Hat Tip to TexasFred for this info. He asks: Do you remember the name of Russia during the Soviet era? United Soviet Socialist Republic? The USSR. 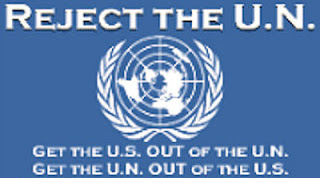 And that is where the USSA is rapidly heading! Can outright communism be too far away? Is it all starting to come together for you now? Hat Tip to Muse with Indy Jane for the picture of Commissar Obama! Tags: Barack Obama, Indy Jane, TexasFred, USA, USSR, Nikita Khrushchev To share or post to your site, click on "Post Link". Please mention / link to the ARRA News Service. Thanks! Yes Fred Commissar Barry has his Apparatchiks in place and the bacchanal is soon to begin, with all the appropriate schadenfreude. You can expect the same mercy the 30+ million Ukrainian received under Uncle Joe. Can outright communism be too far away you ask? It has been here for a long time "small doses", the frog in the heating water, degree by degree.